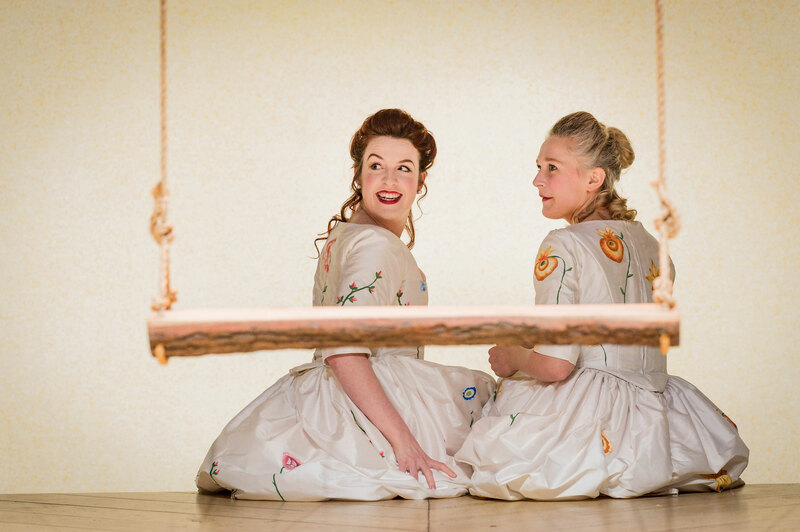 The splendid English Touring Opera brings Mozart and Da Ponte’s effervescent confection of a show to town in a lively and elegant production. Paul Higgins directs with a flair for comic business that is totally in keeping with the spirit of the piece and supporting Martin Fitzpatrick’s witty translation. This was the first time I have heard Così in English; I have hitherto been a bit of a purist (snob) preferring to hear opera in their original languages (composers repeat words, phrases and even syllables for a particular sound) but I found not having to keep an eye on surtitles liberating and actively listening to the words as dialogue made the show fresh, and what is usually an amusing and charming piece became laugh-out-loud funny. It is an unadulterated delight. It begins with the cast spending the overture tearing around after each other in a game of hide and seek, running in and out of the doorways of decreasing size in Samal Blak’s elegant but simple set. This matches the instruments that chase each other through Mozart’s coruscating motifs and also sets the tone for fun and game-playing. Laura Mitchell is a striking Fiordiligi; her duets with Kitty Whately as her sister Dorabella are sublime. The sisters are a silly pair, given to histrionics and melodrama at the drop of a hat. When they are faced with real rather than theoretical temptation, they each falter and succumb – although Fiordiligi is harder work. Her seduction by the disguised Ferrando is one of my favourite moments in all opera. Speaking of Ferrando, Anthony Gregory is superb, with excellent comic timing and an achingly beautiful tenor voice. Toby Girling is his mate, the cocksure Guglielmo, is also a fine comedian. There is a wealth of physical humour going on and the men in particular handle it very well. Richard Mosley-Evans is a delight as the scheming Don Alfonso. His trio with the girls “Oh, breezes be gentle” (Soave Sia Il Vento) is absolutely delicious. Paula Sides steals it, however, as disgruntled maid Despina. She gets to dress up as a doctor of magnetism to cure the disguised suitors of poisoning (don’t ask) and also an attorney to stage a false wedding. Her vocal distortions are very funny without distorting the quality of the notes. It’s a shame her hilarious doctor’s outfit with its rather medieval beaked mask muffles her a bit. It’s all a frothy bit of nonsense, a rom-com of no import – or is it? Mozart gives us confection but also sneaks up on us with the emotional power of his score. This is not merely a box of posh chocolates. It is something more nutritious than that. Mozart reminds us that even these airheads and ninnies are people too and as we respond to their emotions, points out that our own humanity lies beneath the faces and pretexts we adopt in our own ridiculous lives. It’s an absolute pleasure to spend an evening in his company.